From now on I have a new website, on which you can find my official News and my other stories about my life as a Triathlet aiming for the Olympic goal. The adress is www.andreasgiglmayr.at , have fun reading! The first Triathlon race of the season is done and I enjoyed every minute of it. It was the good hit out we wanted and I raced up to my expectations. After nearly four weeks of training in Canberra, it was a good chance to see where we are at the moment and to grab some ITU points. We haven`t done any fast running yet and so I already knew before, that it gonna be interesting with a strong field of New Zealanders and Aussies on the line. But the course is one of the harder ones (much better then this flat city circuit stuff), so it was a good test in all three disciplines. I felt good in the swim in the last few weeks and as well on the race today. The water was choppy and it was lots of fighting at the beginning, but I swam my way back to the front pack again. So on the first bike kms we were Tony Doods, James Elvery, Aaron Barclay, Jamie Huggett and me. Later on Sissons, Brandon Sexton and another two guys joined the group. Out on the run, I felt the hard bike quite a bit, but so did the others. Only Doods had a great day and got away. So it was Sexton, Huggett and me battling out the podium. Finally I didn`t had the speed, so I finished 4th with 9sec on Sexton and four sec on Huggett. We are in a very early stage of the season and my first bigger race will be Sydney WCS in eight weeks, so I`m pleased with this result and tomorrow I will be back to "work". The real big races for me are coming then middle of June, way to go!!!! The pic above is with them, enjoying the sunset and some fish and chips after the race! After about four weeks of training in Canberra, coach Darren and I decided that it would be a good thing to go to the ITU race in Kinloch. Not that my form is close to racing shape, but it`s good to get a nice hit out to see where we are at the moment and also to get this race feeling back. After that, we have eight weeks time to Sydney WCS and still can work on a lot of things. The last two weeks we worked with running coach Rob, who came over from Kenia, manly on our running form. So sometimes we did up to three hours of drills, but no fast running. So the sprint race on the weekend at lake Taupo will be a bit of a shock to the system, but I`m looking forward to race again after five months away from racing. I have a homestay at Bevan Dochertys parents house, which is very nice and they are looking very good after me:) Thanks a lot for that!!! I keep you updated how the race was going! 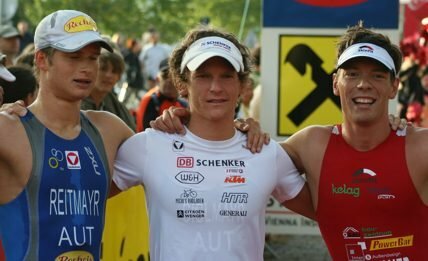 Dieser Blog ist als Ergänzung zu meiner Hompage http://www.andreasgiglmayr.at/ gedacht, um meine alltäglichen Gedanken und mein Leben als Triathlet, mit allen Interessierten teilen zu können!